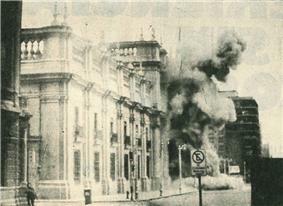 The Bombing of La Moneda on 11 September 1973 by the Junta's Armed Forces. Armed forces put the country under military control. Little and unorganized civil resistance. Before Pinochet's rule, Chile had for decades been hailed as a beacon of democracy and political stability while the rest of South America had been plagued by military juntas and Caudillismo. Historian Peter Winn characterized the 1973 coup as the most violent events in Chile's history. A weak insurgent movement against the Pinochet regime was maintained inside Chile by elements sympathetic to the former Allende government. An internationally supported plebiscite in 1988 eventually removed Pinochet from power. Allende contested the Radomiro Tomic of the Christian Democratic Party. Allende received 36.6% of the vote. Alessandri was a very close second with 35.3%, and Tomic third with 28.1%. Although Allende received the highest number of votes, according to the Chilean constitution and since none of the candidates won by an absolute majority, the National Congress had to decide among the candidates. The Chilean constitution did not allow a person to sit as president for two consecutive terms so the incumbent president, Eduardo Frei Montalva, was thus ineligible as a candidate. The CIA's "Track I" operation was a plan to influence the Congress to choose Alessandri, who would resign after a short time in office, forcing a second election. Frei would then be eligible to run. Alessandri announced on 9 September that if Congress chose him, he would resign. Congress then decided on Allende. Soon after hearing news of his win, Allende signed a Statute of Constitutional Guarantees, which stated that he would follow the constitution during his presidency. The U.S. feared "an irreversible Marxist regime in Chile" and exerted diplomatic, economic, and covert pressure upon Chile's elected socialist government. At the end of 1971, the Cuban Prime Minister Fidel Castro made a four-week state visit to Chile, alarming Western observers worried about the "Chilean Way to Socialism" yielding to Cuban Socialism, i.e., a dictatorial single-party state. In 1972, economics minister Pedro Vuskovic adopted monetary policies that increased the amount of circulating currency and devalued the escudo, which increased inflation to 140 percent in 1972 and engendered a black market economy. In October 1972, Chile suffered the first of many strikes. Among the participants were small-scale businessmen, some professional unions, and student groups. Its leaders – Vilarín, Jaime Guzmán, Rafael Cumsille, Guillermo Elton, Eduardo Arriagada – expected to depose the elected government. Other than damaging the national economy, the principal effect of the 24-day strike was drawing Army head, Gen. Carlos Prats, into the government as Interior Minister, an appeasement to the right wing. (Gen. Prats had succeeded Army head Gen. René Schneider after his assassination on 24 October 1970 by a group led by Gen. Roberto Viaux, whom the Central Intelligence Agency had not attempted to discourage.) Gen. Prats supported the legalist Schneider Doctrine and refused military involvement in a coup d'état against President Allende. Despite the declining economy, President Allende's Popular Unity coalition increased its vote to 43.2% in the March 1973 parliamentary elections; but, by then, the informal alliance between Popular Unity and the Christian Democrats ended. The Christian Democrats allied with the right-wing National Party, who were opposed to Allende's Socialist government; the two right-wing parties forming the Confederation of Democracy (CODE). The internecine parliamentary conflict, between the legislature and the executive branch, paralyzed the activities of government. The CIA paid some U.S. $6.8–$8 million to right-wing opposition groups to "create pressures, exploit weaknesses, magnify obstacles" and hasten Allende's ouster. The success and influence of the Cuban Revolution not only worried the United States and its allies, but inspired leftist movements in many Latin American countries, particularly in Chile. The Cuban Revolution identified with Chilean Socialists on multiple levels, including culture, geography, history, and economically. The future president Salvador Allende, while serving as a senator for the Chilean Socialist Party, visited post-revolution Cuba and was awestruck. Allende, shortly following his inauguration, renewed the Chilean relationship with Cuba and Fidel Castro. Allende overtook three private manufacturing companies, including two US-owned companies, turning them over to government control. At this time, citizens feared the viability of their financial institutions and began heavily withdrawing savings, creating a run on the banks. In order to strengthen the Chilean economy, Allende promised guaranteed deposits. Yet Allende began to fear his opponents, convinced they were plotting his assassination. Allende, using his daughter as a messenger, explained to Castro the situation. Castro advised Allende on four things: convince technicians to stay in Chile, only sell copper for dollars, avoid extreme revolutionary acts which would give opponents an excuse to pull down or control the economy, and to maintain a proper relationship with the Chilean military until local militias could be established and consolidated. Allende attempted to follow Castro's advice, but the latter two recommendations were easier said than done. On 29 June 1973, Colonel Fatherland and Liberty" paramilitary group, was followed by a general strike at the end of July that included the copper miners of El Teniente. In August 1973, a constitutional crisis occurred; the Supreme Court publicly complained about the Allende Government's inability to enforce the law of the land. On 22 August, the Chamber of Deputies (with the Christian Democrats united with the National Party) accused the Allende Government of unconstitutional acts and called upon the military to enforce constitutional order. For months, the Allende Government had feared calling upon the Carabineros (Carabineers) national police, suspecting them to be disloyal. On 9 August, Allende appointed Gen. Carlos Prats as Minister of Defence. He was forced to resign both as defence minister and as the Army Commander-in-chief on 24 August 1973, embarrassed by the Alejandrina Cox incident and a public protest of the wives of his generals before his house. Gen. Augusto Pinochet replaced him as Army commander-in-chief the same day. In late August 1973, 100,000 Chilean women congregated at Plaza de la Constitución to protest against Allende's Government for the rising cost and increasing shortages of food and fuels, but they were dispersed with tear gas. On 26 May 1973, Chile’s Supreme Court unanimously denounced the Allende régime’s disruption of the legality of the nation in its failure to uphold judicial decisions. It refused to permit police execution of judicial resolutions that contradicted the Government's measures. On 22 August 1973, with the support of the Christian Democrats and National Party members, the Chamber of Deputies passed 81–47 a resolution that asked "the President of the Republic, Ministers of State, and members of the Armed and Police Forces" to "put an immediate end" to "breach[es of] the Constitution . . . with the goal of redirecting government activity toward the path of Law and ensuring the Constitutional order of our Nation, and the essential underpinnings of democratic co-existence among Chileans." The resolution declared that the Allende Government sought ". . . to conquer absolute power with the obvious purpose of subjecting all citizens to the strictest political and economic control by the State . . . [with] the goal of establishing a totalitarian system", claiming it had made "violations of the Constitution . . . a permanent system of conduct." Essentially, most of the accusations were about the Socialist Government disregarding the separation of powers, and arrogating legislative and judicial prerogatives to the executive branch of government. Finally, the resolution condemned the creation and development of government-protected armed groups, which . . . are headed towards a confrontation with the armed forces. President Allende's efforts to re-organize the military and the police forces were characterised as notorious attempts to use the armed and police forces for partisan ends, destroy their institutional hierarchy, and politically infiltrate their ranks. It can be argued that the resolution called upon the armed forces to overthrow Allende if he did not reform, as follows "...To present the President of the Republic, Ministers of State, and members of the Armed and Police Forces with the grave breakdown of the legal and constitutional order ... it is their duty to put an immediate end to all situations herein referred to that breach the Constitution and the laws of the land with the aim of redirecting government activity toward the path of Law "
Two days later, on 24 August 1973, President Allende responded, characterising the Congress's declaration as destined to damage the country’s prestige abroad and create internal confusion, predicting It will facilitate the seditious intention of certain sectors. He noted that the declaration had not obtained the two-thirds Senate majority constitutionally required to convict the president of abuse of power: essentially, the Congress were invoking the intervention of the armed forces and of Order against a democratically elected government and subordinat[ing] political representation of national sovereignty to the armed institutions, which neither can nor ought to assume either political functions or the representation of the popular will. Allende argued he had obeyed constitutional means for including military men to the cabinet at the service of civic peace and national security, defending republican institutions against insurrection and terrorism. In contrast, he said that Congress was promoting a coup d’état or a civil war with a declaration full of affirmations that had already been refuted before-hand and which, in substance and process (directly handing it to the ministers rather than directly handing it to the President) violated a dozen articles of the Constitution. He further argued that the legislature was usurping the government's executive function. President Allende wrote: Chilean democracy is a conquest by all of the people. It is neither the work nor the gift of the exploiting classes, and it will be defended by those who, with sacrifices accumulated over generations, have imposed it . . . With a tranquil conscience . . . I sustain that never before has Chile had a more democratic government than that over which I have the honor to preside . . . I solemnly reiterate my decision to develop democracy and a state of law to their ultimate consequences . . . Parliament has made itself a bastion against the transformations . . . and has done everything it can to perturb the functioning of the finances and of the institutions, sterilizing all creative initiatives. Adding that economic and political means would be needed to relieve the country's current crisis, and that the Congress were obstructing said means—having already paralyzed the State—they sought to destroy it. He concluded by calling upon the workers, all democrats and patriots to join him in defending the Chilean Constitution and the revolutionary process. Although CIA did not instigate the coup that ended Allende's government on 11 September 1973, it was aware of coup-plotting by the military, had ongoing intelligence collection relationships with some plotters, and—because CIA did not discourage the takeover and had sought to instigate a coup in 1970—probably appeared to condone it. The report stated that the CIA "actively supported the military Junta after the overthrow of Allende but did not assist Pinochet to assume the Presidency." After a review of recordings of telephone conversations between Nixon and Henry Kissinger, Robert Dallek concluded that both of them used the CIA to actively destabilize the Allende government. In one particular conversation about the news of Allende's overthrow, Kissinger complains about the lack of recognition of the American role in the overthrow of a "communist" government, upon which Nixon remarked "Well, we didn't - as you know - our hand doesn't show on this one." Historian Peter Winn found "extensive evidence" of United States complicity in the coup. He states that its covert support was crucial to engineering the coup, as well as for the consolidation of power by the Pinochet regime following the takeover. Winn documents an extensive CIA operation to fabricate reports of a coup against Allende, as justification for the imposition of military rule. Peter Kornbluh asserts that the CIA destabilized Chile and helped create the conditions for the coup, citing documents declassified by the Clinton administration. Other authors point to the involvement of the Defense Intelligence Agency, agents of which allegedly secured the missiles used to bombard the La Moneda Palace. Nonetheless, historian Mark Falcoff credits the CIA with preserving democratic opposition to Allende and preventing the "consolidation" of his supposed "totalitarian project". The U.S. Government's hostility to the election of Allende in Chile was substantiated in documents declassified during the Jorge Alessandri as the winner of the presidential election. Alessandri, who was an accessory to the conspiracy, was ready to then resign and call for fresh elections. The other approach of the CIA, also known as the ITT Corporation owned of 70% of Chitelco, the Chilean Telephone Company, and also funded El Mercurio. The CIA used ITT as a means of disguising the source of the illegitimate funding Allende's opponents received. On 28 September 1973, ITT's headquarters in New York City, was bombed, allegedly for the involvement of the company in Allende's overthrow. By 7:00 am on 11 September 1973, the Navy captured Valparaíso, strategically stationing ships and marine infantry in the central coast and closed radio and television networks. The Province Prefect informed President Allende of the Navy's actions; immediately, the president went to the presidential palace with his bodyguards, the "Group of Personal Friends" (GAP). By 8:00 am, the Army had closed most radio and television stations in Santiago city; the Air Force bombed the remaining active stations; the President received incomplete information, and was convinced that only a sector of the Navy conspired against him and his government. President Allende and Defence minister Orlando Letelier were unable to communicate with military leaders. Admiral Montero, the Navy's commander and an Allende loyalist, was rendered incommunicado; his telephone service was cut and his cars were sabotaged before the coup d’état, to ensure he could not thwart the opposition. Leadership of the Navy was transferred to José Toribio Merino, planner of the coup d’état and executive officer to Adm. Montero. Augusto Pinochet, General of the Army, and Gustavo Leigh, General of the Air Force, did not answer Allende's telephone calls to them. The General Director of the Carabineros (uniformed police), José María Sepúlveda, and the head of the Investigations Police (plain clothes detectives), Alfredo Joignant answered Allende's calls and immediately went to the La Moneda presidential palace. When Defence minister Letelier arrived at the Ministry of Defense, controlled by Adm. Patricio Carvajal, he was arrested as the first prisoner of the coup d’état. Despite evidence that all branches of the Chilean armed forces were involved in the coup, Allende hoped that some units remained loyal to the government. Allende was convinced of Pinochet's loyalty, telling a reporter that the coup d’état leaders must have imprisoned the general. Only at 8:30 am, when the armed forces declared their control of Chile and that Allende was deposed, did the president grasp the magnitude of the military's rebellion. Despite the lack of any military support, Allende refused to resign his office. At approx. 9:00 the carabineros of the La Moneda left the building. By 9:00 am, the armed forces controlled Chile, except for the city centre of the capital, Santiago. Allende refused to surrender, despite the military's declaring they would bomb the La Moneda presidential palace if he resisted being deposed. The Socialist Party proposed to Allende that he escape to the San Joaquín industrial zone in southern Santiago, to later re-group and lead a counter-coup d’état; the president rejected the proposition. The military attempted negotiations with Allende, but the President refused to resign, citing his constitutional duty to remain in office. Finally, Allende gave a farewell speech, telling the nation of the coup d’état and his refusal to resign his elected office under threat. Leigh ordered the presidential palace bombed, but was told the Air Force's Hawker Hunter jet aircraft would take forty minutes to arrive. Pinochet ordered an armoured and infantry force under General Sergio Arellano to advance upon the La Moneda presidential palace. When the troops moved forward, they were forced to retreat after coming under fire from GAP snipers perched on rooftops. General Arellano called for helicopter gunship support from the commander of the Chilean Army Puma helicopter squadron and the troops were able to advance again. Chilean Air Force aircraft soon arrived to provide close air support for the assault (by bombing the Palace), but the defenders did not surrender until nearly 2:30 pm. First reports said the 65-year-old president had died fighting troops, but later police sources reported he had committed suicide. In the first months after the coup d’état, the military killed thousands of Chilean Leftists, both real and suspected, or forced their "disappearance". The military imprisoned 40,000 political enemies in the National Stadium of Chile; among the tortured and killed desaparecidos (disappeared) were the U.S. citizens Charles Horman, and Frank Teruggi. In October 1973, the Chilean songwriter Víctor Jara, and 70 other political killings were perpetrated by the death squad, Caravan of Death (Caravana de la Muerte). The government arrested some 130,000 people in a three-year period; the dead and disappeared numbered thousands in the first months of the military government. Those include the British physician Sheila Cassidy, who survived to publicize to the UK the human rights violations in Chile. Among those detained was Alberto Bachelet (father of future Chilean President Michelle Bachelet), an air force official; he was tortured and died on 12 March 1974,. The right-wing newspaper, El Mercurio (The Mercury), reported that Mr Bachelet died after a basketball game, citing his poor cardiac health. Michelle Bachelet and her mother were imprisoned and tortured in the Villa Grimaldi detention and torture centre on 10 January 1975. After Gen. Pinochet lost the election in the 1988 plebiscite, the Rettig Commission, a multi-partisan truth commission, in 1991 reported the location of torture and detention centers, among others, Colonia Dignidad, Esmeralda ship and Víctor Jara Stadium. Later, in November 2004, the Valech Report confirmed the number as less than 3,000 killed, and reduced the number of cases of forced disappearance; but some 28,000 people were arrested, imprisoned, and tortured. In El día decisivo (The Decisive Day), Pinochet recounts the coup d’état, affirming he was the leading plotter. Pinochet said that he co-ordinated from his army commander office the deposition of President Salvador Allende. Recently, high military officials from the time said Pinochet was at first a reluctant participant and followed the lead of Adm. Merino and air force Gen. Leigh. Fewer than 60 individuals died as a direct result of fighting on 11 September although the MIR and GAP continued to fight the following day. In all, 46 of Allende's guard (the GAP, Grupo de Amigos Personales) were killed, some of them in combat with the soldiers that took the Moneda. Allende's Cuban-trained guard would have had about 300 elite commando-trained GAP fighters at the time of the coup, but the use of brute military force, especially the use of Hawker Hunters, may have handicapped many GAP fighters from further action. According to official reports prepared after the return of the democracy, at La Moneda only two people died: President Allende and the journalist Augusto Olivares (both by suicide). Two more were injured, Antonio Aguirre and Osvaldo Ramos, both members of President Allende's entourage; they would later be allegedly kidnapped from the hospital and disappeared. In November 2006, the Associated Press noted that more than 15 bodyguards and aides were taken from the palace during the coup and are still unaccounted for; in 2006 Augusto Pinochet was indicted for two of their deaths . On the military side, there were 34 deaths: two army sergeants, three army corporals, four army privates, 2 navy lieutenants, 1 navy corporal, 4 naval cadets, 3 navy conscripts and 15 carabineros. In Mid-September, the Chilean military junta claimed its troops suffered another 16 dead and 100 injured by gunfire in mop-up operations against Allende supporters, and Pinochet said "sadly there are still some armed groups who insist on attacking, which means that the military rules of wartime apply to them." A press photographer also died in the crossfire while attempting to cover the event. On 23 October 1973, 23-year-old Army Corporal Benjamín Alfredo Jaramillo Ruz, who was serving with the Cazadores, became the first fatal casualty of the counterinsurgency operations in the mountainous area of Alquihue in Valdivia after being shot by a sniper. The Chilean Army suffered 12 killed in various clashes with MIR guerrillas and GAP fighters in October 1973. 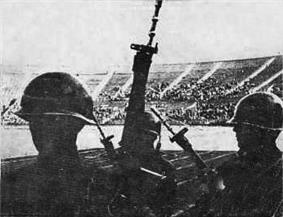 While fatalities in the battle during the coup might have been relatively small, the Chilean security forces sustained 162 dead in the three following months as a result of continued resistance and tens of thousands of people were arrested during the coup and held in the National Stadium. This was because the plans for the coup called for the arrest of every man, woman and child on the streets the morning of 11 September. Of these approximately 40,000 to 50,000 perfunctory arrests, several hundred individuals would later be detained, questioned, tortured, and in some cases murdered. While these deaths did not occur before the surrender of Allende's forces, they occurred as a direct result of arrests and round-ups during the coup's military action. President Allende died in La Moneda during the coup. The junta officially declared that he committed suicide with a rifle given to him by Fidel Castro, two doctors from the infirmary of La Moneda stated that they witnessed the suicide, and an autopsy labelled Allende's death a suicide. Vice Admiral Patricio Carvajal, one of the primary instigators of the coup, claimed that "Allende committed suicide and is dead now." At the time, few of Allende's supporters believed the explanation that Allende had killed himself. Allende's body was exhumed in May 2011. A scientific autopsy was performed and the autopsy team delivered a unanimous finding on 19 July 2011 that Allende committed suicide using an AK-47 rifle. However, on May 31, 2011, Chile's state television station reported that a top-secret military account of Allende's death had been discovered in the home of a former military justice official. The 300-page document was only found when the house was destroyed in the 2010 Chilean earthquake. After reviewing the report, two forensic experts told TVN "that they are inclined to conclude that Allende was assassinated." On 13 September, the Junta dissolved Congress. At the same time, it outlawed the parties that had been part of the Popular Unity coalition, and all political activity was declared "in recess". 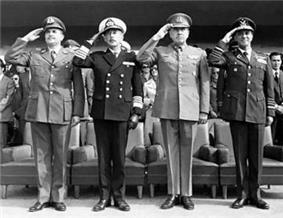 Initially, there were four leaders of the junta: In addition to General Augusto Pinochet, from the Army, there were General Gustavo Leigh Guzmán, of the Air Force; Admiral José Toribio Merino Castro, of the Navy (who replaced Constitutionalist Admiral Raúl Montero); and General Director César Mendoza Durán, of the National Police (Carabineros de Chile) (who replaced Constitutionalist General Director José María Sepúlveda). Coup leaders soon decided against a rotating presidency and named General Pinochet permanent head of the junta. In the months that followed the coup, the junta, with authoring work by historian Gonzalo Vial and admiral Patricio Carvajal, published a book titled El Libro Blanco del cambio de gobierno en Chile (commonly known as El Libro Blanco, "The White Book of the Change of Government in Chile"), where they attempted to justify the coup by claiming that they were in fact anticipating a self-coup (the alleged Plan Zeta, or Plan Z) that Allende's government or its associates were purportedly preparing. Historian Peter Winn states that the Central Intelligence Agency had an extensive part to play in fabricating the conspiracy and in selling it to the press, both in Chile and internationally. Although later discredited and officially recognized as the product of political propaganda, some Chilean historians pointed to the similarities between the alleged Plan Z and other existing paramilitary plans of the Popular Unity parties in support of its legitimacy. The newspaper La Tercera published on its front page a photograph showing prisoners at the Quiriquina Island Camp who had been captured during the fighting in Concepción. The photograph's caption stated that some of the detained were local leaders of the "Unidad Popular" while others were "extremists who had attacked the armed forces with firearms". The photo is reproduced in Docuscanner. This is consistent with reports in newspapers and broadcasts in Concepción about the activities of the Armed Forces, which mentioned clashes with "extremists" on several occasions from 11 to 14 September. Nocturnal skirmishes took place around the Hotel Alonso De Ercilla in Colo Colo and San Martino Street, one block away from the Army and military police administrative headquarters. A recent published testimony about the clashes in Concepcion offers several plausible explanations for the reticence of witnesses to these actions. Besides political leaders and participants, the coup also affected many everyday Chilean citizens. Thousands were killed, went missing, and were injured. Because of the political instability in their country, many relocated elsewhere. Canada, among other countries, became a main point of refuge for many Chilean citizens. Through an operation known as “Special Movement Chile”, more than 7,000 Chileans were relocated to Canada in the months following September 11, 1973. These refugees are now known as Chilean Canadian people and have a population of over 38,000. Project FUBELT – secret CIA operations to unseat Allende. 2013 Egyptian coup d'état, started with attacks on the government and was also polarising with ongoing repressions and media support. ^ Lawson, George (2005). Negotiated Revolutions. p. 182. The only armed resistance came in a handful of factories, the La Legua poblacion in Santiago and in isolated gunfights with MIR activists. ^ Peter Kornbluh. "Chile and the United States: Declassified Documents Relating to the Military Coup, September 11, 1973". ^ "CHILE: The Bloody End of a Marxist Dream", Time Magazine, Quote: "....Allende's downfall had implications that reached far beyond the borders of Chile. His had been the first democratically elected Marxist government in Latin America..."
^ Genaro Arriagada Herrera, ''Pinochet: The Politics of Power''. Google Books. Retrieved 19 November 2011. ^ a b c Winn, Peter (2010). Grandin & Joseph, Greg & Gilbert, ed. A Century of Revolution. Duke University Press. pp. 239–275. ^ Peter Kornbluh (19 September 2000). "CIA Acknowledges Ties to Pinochet’s Repression: Report to Congress Reveals U.S. Accountability in Chile". Chile Documentation Project. National Security Archive. Archived from the original on 28 November 2006. Retrieved 26 November 2006. ^ "Salvador Allende's Last Speech – Wikisource". ^ Davison, Phil (20 June 2009). "Hortensia Bussi De Allende: Widow of Salvador Allende who helped lead opposition to Chile's military dictatorship". The Independent (London). Retrieved 20 April 2010. ^ Gott, Richard (12 September 2009). "From the archive: Allende 'dead' as generals seize power". The Guardian (London). Retrieved 20 April 2010. ^ Winn, Peter (2010). "Furies of the Andes". In Grandin & Joseph, Greg & Gilbert. A Century of Revolution. Durham, NC: Duke University Press. p. 259. Retrieved 17 September 2015. ^ "El Partido Socialista de Chile Tomo II" (PDF). Julio César Jobet (in Spanish). p. 120. Archived from the original (PDF) on 2009-10-25. Retrieved 2009-06-05. ^ "CIA Activities in Chile". Central Intelligence Agency. The political action program under consideration called for the Embassy and Station to influence the Chilean Congress as it took up the matter. This involved encouraging Congress to vote for Alessandri for President in spite of the fact Allende received a slightly higher popular vote. (Allende won 36.3 percent of the vote on 4 September--a plurality, not the majority required by the Constitution to avoid Congressional reaffirmation of the victory.) The Station and the Embassy, working through intermediaries, urged Frei to use his influence with Congress to convince non-leftist forces to vote for Alessandri. The scenario was to have Congress elect Alessandri as President; he would then resign, thereby allowing Frei to run as a candidate against Allende in a new election. ^ Régis Debray (1972). The Chilean Revolution: Conversations with Allende. New York: Vintage Books. ^ "Castro speech database", University of Texas: English translations of Castro speeches based upon the records of the (United States) Foreign Broadcast Information Service (FBIS). See locations of speeches for November–December 1971. Retrieved 22 September 2006. ^ a b (Spanish) Comienzan los problemas at the Wayback Machine (archived August 2, 2007), part of series "Icarito > Enciclopedia Virtual > Historia > Historia de Chile > Del gobierno militar a la democracia" on LaTercera.cl. Retrieved 22 September 2006. ^ "mun6". Jornada.unam.mx. Retrieved 19 November 2011. ^ a b c (Spanish) Se desata la crisis at the Wayback Machine (archived November 9, 2007), part of series "Icarito > Enciclopedia Virtual > Historia > Historia de Chile > Del gobierno militar a la democracia" on LaTercera.cl. Retrieved 22 September 2006. ^ "CIA, Operating Guidance Cable on Coup Plotting, 16 October 1970", National Security Archive, George Washington University: Quote: In a secret cable, CIA deputy director of plans, Thomas Karamessines, conveys Kissinger's orders to CIA station chief in Santiago, Henry Hecksher: "It is firm and continuing policy that Allende be overthrown by a coup." The "operating guidance" makes it clear that these operations are to be conducted so as to hide the "American hand," and that the CIA is to ignore any orders to the contrary from Ambassador Edward M. Korry, who has not been informed of Track II operations. ^ Adams, Jerome R. (2010). Liberators, patriots, and leaders of Latin America 32 biographies (2nd ed.). Jefferson, N.C.: McFarland & Co. pp. 213–214. ^ (the tank attack)El TanquetazoSecond coup attempt: at the Wayback Machine (archived October 13, 2004), originally on RebelYouth.ca. Unsigned, but with citations. Archived on Internet Archive 13 October 2004. ^ "The Bloody End of a Marxist Dream" (PDF). Time. 24 September 1973. Retrieved 12 January 2014. ^ "JosePinera.com". Archived from the original on 2013-06-22. Retrieved 2013-06-20. ^ "el Presidente de la República y a los señores Ministros de Estado y miembros de las Fuerzas Armadas y del Cuerpo de Carabineros" Acuerdo de la Cámara de Diputados). ^ English translation on Wikisource. ^ (Spanish) La respuesta del Presidente Allende on Wikisource. (English) English translation on Wikisource. Retrieved 22 September 2006. ^ Shane, Scott (2007-04-18), Robert Dallek on Nixon and Kissinger, New York Times, archived from the original on 2014-01-14, [...] phone call reacting to news of the 1973 coup in Chile [...] Kissinger grumbled [...] that American newspapers, "instead of celebrating," were "bleeding because a pro-Communist government has been overthrown." "Isn't that something?" Nixon remarked. "In the Eisenhower period, we would be heroes," Kissinger said. "Well, we didn't - as you know - our hand doesn't show on this one," the president said. ^ a b Kornbluh, Peter (2003). The Pinochet File: A Declassified Dossier on Atrocity and Accountability. New York: The New Press. ^ Falcoff, Mark, Kissinger and Chile, Commentary, 2003. ^ Ad Hoc Interagency Working Group on Chile (4 December 1970). "Memorandum for Mr. Henry Kissinger". United States Department of State. Retrieved 10 December 2007. ^ "U.S. Dept. of State FOIA Electronic Reading Room – Hinchey Report (CIA Activities in Chile)". Foia.state.gov. Retrieved 19 November 2011. ^ Stout, David (30 January 2003). "Edward Korry, 81, Is Dead; Falsely Tied to Chile Coup". The New York Times. Retrieved 20 April 2010. ^ The Pinochet File: How U.S. Politicians, Banks and Corporations Aided Chilean Coup, Dictatorship. Democracy Now! September 10, 2013. ^ Montgomery, Paul L. (29 September 1973). "I.T.T. OFFICE HERE DAMAGED BY BOMB; Caller Linked Explosion at Latin-American Section to 'Crimes in Chile' I.T.T. Latin-American Office on Madison Ave. Damaged by Bomb Fire in Rome Office Bombing on the Coast Rally the Opponents". The New York Times. Retrieved 20 April 2010. ^ "El balcón del adiós | Reportajes". La Tercera Edición Impresa. ^ "ROME NEWS TRIBUNE Sep 11, 1973". Google. 11 September 1973. Retrieved 19 November 2011. ^ Michael Evans. "National Security Archive Electronic Briefing Book No. 33". Gwu.edu. Retrieved 19 November 2011. ^ Collins, Stephen (16 December 2000). "Now open – Pinochet's torture chambers". The Daily Telegraph (London). Retrieved 20 April 2010. ^ "Chile Issues Report on Pinochet Torture | Article from AP Online | HighBeam Research". Archived from the original on 5 May 2009. Retrieved 11 April 2009. ^ MacAskill, Ewen (3 March 2000). "Right rejoices as general's foes vow to keep up fight". The Guardian (London). Retrieved 20 April 2010. ^ a b "Chile's President-Elect". Pbs.org. Retrieved 19 November 2011. ^ a b "Chile's Bachelet visits site of her own torture". Alertnet.org. 6 November 2011. Retrieved 19 November 2011. ^ "From torture victim to president. (Michelle Bachelet) : An article from: The Progressive". Amazon.com. Retrieved 19 November 2011. ^ "Chile: The Good Democracy?". Zmag.org. Retrieved 19 November 2011. ^ a b "Chile set to elect first woman President". The Hindu. India. 14 January 2006. Retrieved 19 November 2011. ^ 0,23599,20906656-1702,00.html Little sadness over Pinochet death. ^ "Thousands gather for Pinochet". Taipei Times. Taiwan (ROC). 12 November 2011. Retrieved 19 November 2011. ^ "Chile head revisits torture site". BBC News. 15 October 2006. Retrieved 19 November 2011. ^ "Chile inaugurates female leader". Electionguide.org. Retrieved 19 November 2011. ^ "Chile's Pinochet Charged for Torture, Probed over Gold". Globalpolicy.org. 27 October 2006. Retrieved 19 November 2011. ^ "Chile Leader Visits Site of Her Torture". The Washington Post. 14 October 2006. Retrieved 19 November 2011. ^ "Pinochet stripped of immunity in torture, kidnapping cases". USA Today. 20 January 2006. Retrieved 19 November 2011. ^ "Pinochet Stripped of Legal Immunity". Globalpolicy.org. Associated Press. 11 January 2006. Retrieved 19 November 2011. ^ The Nixon Administration and the Death of Allende's Chile: A Case of Assisted Suicide, Jonathan Haslam, page 64, Verso Press 2005. Books.google.ca. 30 December 2009. Retrieved 19 November 2011. ^ Ferrada, Marcello (13 September 2008). "Marcello Ferrada-Noli. That morning of September 11, 1973. A personal testimony". Stockholm (2008)". Ferrada-noli.blogspot.com. Retrieved 19 November 2011. ^ Associated Press, Pinochet indicted for deaths of Allende bodyguards, put under house arrest, 27 November 2006. Retrieved 11 December 2006. ^ Arce, Juan Alvaro. "Martires y Victimas de la Unidad Popular". Archived from the original on 21 October 2009. ^ "Chile wars armed civilians.". The Montreal Gazette. 17 September 1973. Retrieved 19 November 2011. ^ "Mártires De Las Ff.Aa., De Orden Y Seguridad". Web.archive.org. 11 April 2008. Retrieved 19 November 2011. ^ Latin America's Wars: The age of the professional soldier, 1900–2001, Robert L. Scheina, p. 326. Books.google.co.uk. Retrieved 19 November 2011. ^ Alex Wilde, In Chile, a New Generation Revisits Haunted Space, Ford Foundation Report, Winter 2003. Retrieved 11 December 2006. ^ Ronald Hilton, Chile: The Continuing Historical Conflict, World Association of International Studies, 22 December 1997. Retrieved 22 September 2006. ^ Róbinson Rojas, The murder of Allende and the end of the Chilean way to socialism, originally published by Harper and Row, New York, 1975,1976-Fitzhenry&Whiteside Ltd., Toronto, Canada, 1975. Retrieved 22 September 2006. ^ Chilean president Salvador Allende committed suicide, autopsy confirms The Guardian, 2011-07-20. ^ Comisión Nacional sobre Prisión Política y Tortura CAPÍTULO III Contexto. ^ Vial Correa, Gonzalo (23 September 2003). "Carlos Altamirano, el Plan Z y la "Operación Blanqueo"". La Segunda. ^ Foster, John; Carty, Bob. "Chile's 1972 Coup, 40 Years Later: Observances, Part 2". Opencanada.org. Canadian International Council. Retrieved 18 June 2014. Simon Collier & William F. Sater (1996). A History of Chile: 1808–1994. Cambridge: Cambridge University Press. Jeane Kirkpatrick (1979). "Dictatorships and Double Standards", Commentary, November, pp 34–45. Richard Norton-Taylor (1999). "Truth will out: Unearthing the declassified documents in America which give the lie to Lady Thatcher's outburst", The Guardian, 8 July 1999, London. Sigmund, P.E. (1986). "Development Strategies in Chile, 1964–1983: The Lessons of Failure", Chapter 6 in I.J. Kim (Ed. ), Development and Cultural Change: Cross-Cultural Perspectives, New York: Paragon House Publishers, pp. 159–178. Valenzuela, J.S., & Valenzuela, A. (1993). "Modernisation and Dependency: Alternative Perspectives in the Study of Latin-American Underdervelopment", in M.A. Seligson & J.T. Pass-Smith (Eds. ), Development and Underdevelopment: The Political Economy of Inequality, Boulder: Lynnes Rienner, pp. 203–216. CIA acknowledges involvement in Allende's overthrow Pinochet's rise, CNN. The Coup in Chile. Jacobin. September 11, 2015.